Adore how the white wine flavors mesh with the lemon and the sweet peas…perfection in a pot here y’all. Heat the olive oil and garlic in the Dutch oven and add the chicken. Season with salt and pepper and brown on both sides. Then add the white cooking wine, lemon juice and onion. Stir together and cover, cook for about 15 minutes. Prepare the potatoes or other side dish while the peas heat up with the chicken. 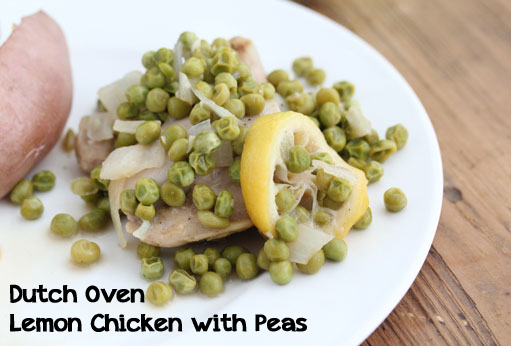 Serve Dutch Oven Lemon Chicken with Peas, along with side dish.